Scandinavians refer to moose as elk. Two subspecies of elk have been introduced to Alaska. Roosevelt elk (Cervus elaphus roosevelti) are larger, slightly darker in color, and have shorter, thicker antlers than the Rocky Mountain elk (Cervus elaphus nelsoni). In many European countries “elk” are actually what we know as moose (Alces alces). Elk are members of the deer family and share many physical traits with deer, moose, and caribou. They are much larger than deer and caribou, but not as large as the moose which occur in Alaska. Distinguishing features include a large yellowish rump patch, a grayish to brownish body, and dark brown legs and neck. Unlike some members of the deer family, both sexes have upper canine teeth. The males have antlers, which in prime bulls are very large, sweeping gracefully back over the shoulders with spikes pointing forward. Elk shed their antlers during the winter each year and grow new ones the following summer. The soft growing antler is covered with “velvet” which is scraped off by rubbing and jousting after the antlers harden in the fall. Fossil bones indicate that a subspecies of elk once existed in Interior Alaska during the Pleistocene period, but all of the elk currently in Alaska were introduced from the Pacific Northwest in the last century. The first successful translocation involved eight Roosevelt elk calves that were captured on the Olympic Peninsula of Washington State in 1928 and moved to Afognak Island (near Kodiak) in 1929. These elk have successfully established themselves on both Afognak and Raspberry Islands. The second successful transplant occurred in 1987, when 33 Roosevelt elk and 17 Rocky Mountain elk were captured in Oregon and moved to Etolin Island (near Petersburg) in Southeast Alaska. These elk subsequently dispersed and established a second breeding population on neighboring Zarembo Island. Elk calves are born in late May or early June when abundant food is available for the mother and the mild weather increases the calves' chances for survival. Birth usually occurs under the cover of dense spruce forests, hidden from predators and protected from the elements. Calves are born with protective coloration (light spotted areas on the back which act as camouflage). A few days after giving birth, the mother joins other cow elk with calves. A single cow will often “babysit” with the calves while the remaining cows seek food. As summer progresses, elk bands move above timberline and feed on the alpine slopes where breezes keep biting insects at bay and young plants are highly nutritious. By July, the calves, although still nursing, begin feeding on succulent forbs. Beginning in August, bands of elk congregate and form herds consisting of cows, calves, yearlings and an occasional mature bull. Nearby, but separate from the herd, can be found small bands of mature bulls. During September, the bulls join the main herds and mating activities (the rut) begin. Large herds are scenes of vigorous activity as mature bulls challenge each other vocally, emitting a high pitched whistle or “bugle,” an eerie but thrilling sound. Occasionally, pushing and shoving matches are initiated by large bulls to lay claim to mating privileges. Smaller bulls may attempt to take advantage of this situation and run past the sparring challengers to mate. By mid-October most breeding activities have ceased. The herds may begin to disperse into smaller bands as they move into wintering areas. The winter months are spent in lower valleys and in the dense spruce forests and small openings near the coastline searching for food. Elk are hardy animals whose large body size and herding tendencies require tremendous amounts of food. From late spring to early fall with a wide variety of food available, elk are mainly grazers, using grasses, forbs, and other leafy vegetation. By late fall they become browsers, feeding on sprouts and branches of shrubs and trees. The elk can become its own worst enemy as large herds often damage their food supply by excessive stripping, trampling, and overcropping of staple food plants, including willow and elderberry. For this reason, it is important to keep elk herds from becoming too large in relation to the available food supply. 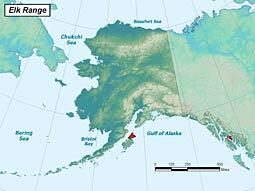 Afognak and Raspberry Islands (near Kodiak) and Zarembo and Etolin Islands (near Petersburg) in Southeast Alaska. From the original eight transplanted calves, Afognak elk had expanded to approximately 1,200 to 1,500 animals by 1965. A series of hard winters with heavy snow accumulation during the late 1960s and early 1970s resulted in extensive natural mortality and reduced calf production and survival. By the mid-1980s the population had recovered to number about 1,200 animals. In the late 2000s the herd was stable at 900 elk. 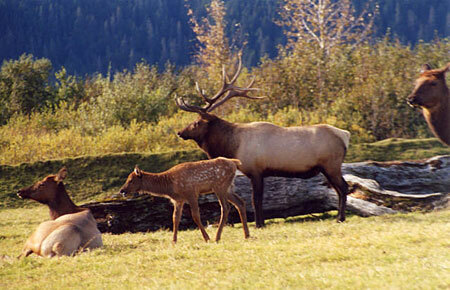 Approximately two-thirds of the 50 elk introduced to Etolin Island died from predation, starvation, and accidents within 18 months of release. Despite the high mortality, the elk population had increased to an estimated 100–125 animals by the early 1990s and elk had successfully dispersed to neighboring islands, establishing a second breeding population on Zarembo Island. A current subjective estimate of the elk population on the two islands is approximately 400 animals, with about 75 percent on Etolin, and the remainder on Zarembo. Elk numbers on other islands are low. Factors which may limit the growth of elk populations include hunting, starvation, disease, predation by brown bears, and a lowered birth rate when the animals become too numerous to be supported by the available food supply. Timber cutting and the development of logging roads also impact an area's carrying capacity for elk. Afognak and Raspberry Islands (near Kodiak), Zarembo and Etolin Islands (near Petersburg) in Southeast Alaska.